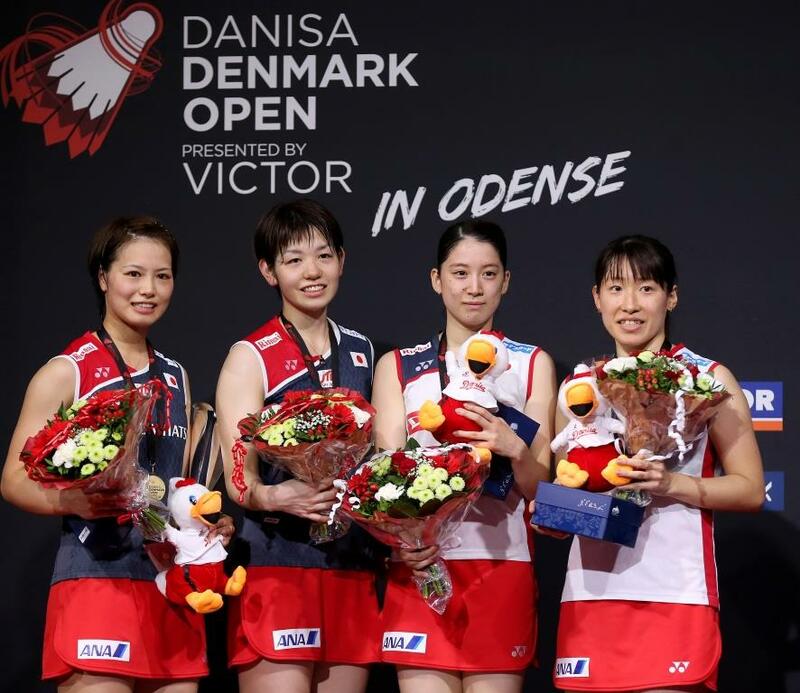 Today’s finals of the DANISA Denmark Open 2018 – Presented by VICTOR gave credence to the assertion that ‘statistics don’t lie’ – with the world No.1 players sweeping the titles. 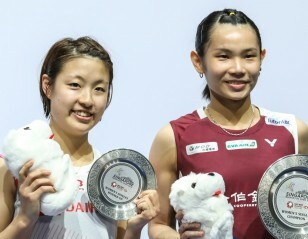 Starting with Tai Tzu Ying (featured image; left) in Women’s Singles and concluding with the equally-unstoppable Kento Momota (featured image; right) in the men’s solo discipline, each final was won by the players who currently enjoy the penthouse position in their respective category. 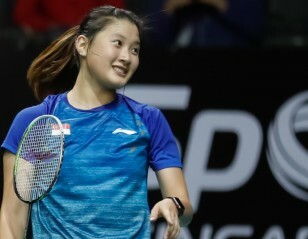 All except Momota – who ascended to the top spot after the draw – had entered the Super 750 tournament as the top seeds and emphatically justified their billing as the ‘ones to beat’. 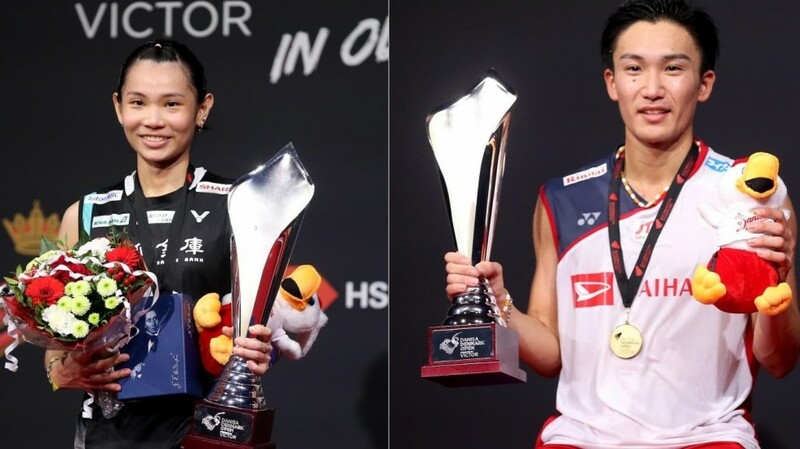 In between the singles stars’ successes, China’s Zheng Siwei/Huang Yaqiong grabbed another Mixed Doubles crown while Japan’s leading ladies, Yuki Fukushima/Sayaka Hirota, landed the Women’s Doubles championship and Indonesia’s hot shots, Marcus Fernaldi Gideon/Kevin Sanjaya Sukamuljo, blazed to the finish in Men’s Doubles. It was the first Denmark Open victory for all the new champions. While 24-year-olds Momota and Tai were taken the distance by Chou Tien Chen of Chinese Taipei and India’s Saina Nehwal respectively, their doubles peers polished off their rivals in straight games, expertly navigating pockets of resistance. In Women’s Doubles, Fukushima/Hirota were only able to wriggle clear of their compatriots, Shiho Tanaka/Koharu Yonemoto, at 16-16 in the opener with a four-point burst. The latter clawed to within one point but got no further. The second game was a bit more comfortable for Fukushima and Hirota in a showdown that featured some punishing rallies, one lasting 104 shots and another 83 shots. The favourites eventually prevailed 21-19 21-16. Their team-mates – Takeshi Kamura/Keigo Sonoda – failed to make it a doubles double for Japan, falling to the non-stop firepower from across the net in Men’s Doubles. Having been denied in the title-decider a year ago, Gideon/Sukamuljo were keen not to slip up again and, despite their arch-rivals’ best efforts, the top guns reigned supreme: 21-15 21-16 in a brisk 36 minutes. The outcome stretched their winning streak in finals to seven out of seven for 2018. “We’re so happy to come back and be champions this year after losing last year’s final,” said an ecstatic Gideon. The win was even sweeter versus a pair who has troubled them in many matches because, as Sukamuljo noted, the Japanese are “very fast and have a good defence”. “We just kept focused and tried to attack them first,” said the 23-year-old. Mixed Doubles was business as usual for Zheng and Huang’s rock-solid partnership. A few early blips against Dechapol Puavaranukroh and Sapsiree Taerattanachai quickly transformed into the smooth machinery that has steamrolled almost all challengers this season. The script was no different on this occasion as the Chinese cruised home, 21-16 21-13 against their Thai opponents. Having been runner-up for the last two years, Zheng credited his blushing new partner for her pivotal role while Huang cited their incremental improvement throughout the match. Meanwhile, the singles finals unfolded similarly with the favourites – Tai and Momota – snatching the first games, only to surrender the second before roaring back in the decisive third. By then, their respective opponents – Nehwal and Chou – were spent forces and could not keep pace with the variety of shots and superior skills with which they had to contend. Tai raced through the Women’s Singles decider, sealing victory 21-13 13-21 21-6 in 52 minutes while Momota had to dig deeper for his 22-20 16-21 21-15 conquest in 77 minutes. “I am pretty excited because I enjoyed this tournament,” said the Chinese Taipei ace, admitting that Nehwal’s second-game comeback surprised her. Second-seeded Momota noted that though he did not have the final all his way, he was able to conserve his energy for the closing exchanges which proved vital; the Japanese capturing ten of the last 12 points.